What Puts “Love” in the Drink of Love? The month of February can mean different things to different people. It can mean the end of football season or that warmer weather and spring activities are on the horizon, but most notably, February holds the celebration of love. Even if you don’t have a significant other and you’re living your best life with your gal pals, family or golfing buddies, Valentine’s Day is a reason to celebrate! What do most people think of when they think of Valentine’s Day? Sure, candles, roses, chocolates and fancy dinners come to mind of love birds, but what about the bubbly? C hampagne speaks to the hearts of loved ones on February 14th, selling over 1.6 million bottles for the annual holiday. But just what makes champagne talk the language of love? Is it the way it’s poured into the ever-so-appealing champagne flute? Is it the fine bubbles as they tickle your tongue? Or maybe the raspberries, strawberries, and chocolate that are so perfectly paired with the wine? In short, champagne and romance pair together so nicely because of the way we perceive it. There’s something about popping open a nice bottle of bubbly with your loved ones and pairing it with fruits and foods that are too perceived as “romantic.” For centuries it has been used to toast to beautiful life moments. 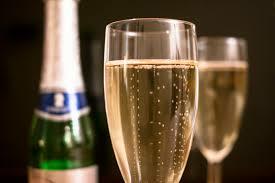 The bubbly is served to parties during hotel stays, anniversaries, date nights, and special celebrations of all kinds. The flavor is different amounts of fruity, sweet and even dry and arguably the most pairable wine in the world. Most people may not know that the same grapes that make our beloved champagne also make some of our favorite wine. Pinot noir grapes, although red in color, make the pale bubbly. In years of its first productions, champagne used to be pale pink in color due to the redness of the pinot noir grape. As time passed and grape skins were left behind, champagne formed into the pale color it is today. The secret to the bubbles? Simply adding sugar to any wine during the process creates a sparkling wine. While you soak in the atmosphere, aromas, and cork popping of your favorite Moët & Chandon, Veuve Clicquot or Dom Perignon, remember the reason for the celebration and capture the moment as the bubbly hits your palate. Love (and a little bit of champagne) is all you need.